On Atheria, the world is divided into Domains – each the realm of a particular kind of magic. In Alaria, the powers of Order reign supreme. In HuSung the Elemental Powers rule. In Chelm the terrible magics of Blood and Shadow dominate. In Dernmarik it’s Dimensional Magic. In Ankorath it is the magic of Life and Healing. In dozens of other realms, other powers rule. When humans are born within a realm they are infused with the powers of that realm, and thus gain their Birthrights – ranging from the deadly mystical toxins granted by the Venom Domain to the regenerative powers of the Realm of Life. Animals too gain power – although it’s extent is a product of their size and intelligence. Great and terrible whales may swim within Atheria’s seas, perhaps with Birthright powers far, far, greater than man’s – but only fools would seek to hunt them. On the land, each domain spawns it’s variants on the major species – and often more than one. The Dernmarik (Dimensional Domain) Black Bear is commonly known as the “Drop”, “Pit”, or “Ambush” Bear. Their Birthright lets them generate a modest dimensional “pocket” – taking the form of a cave or den with a few logs, heaps of dry leaves and grass, and pools of water scattered about – into which they can retreat and close the entryway while still maintaining sensory awareness of the world outside. While this is an excellent way to avoid other predators, hunters, and the winter cold, it also offers them unusual options as ambush predators. They have been known to place one of their pockets along a game trail and hunt by waiting for something appropriate to come along. Depending on how they’ve positioned the gateway to their den-pocket they will then reach out to attack it, drop down onto it, or attempt to open their portal under it’s feat to get it to fall into their pocket-realm. Fortunately for travelers, this is a relatively rare behavior. 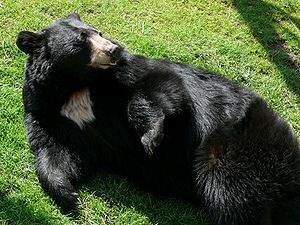 Over the past six millennia the humans of Dernmarik have selectively bred and raised some black bears (often known as “Pocket Bears”) to accept humans as their families. They are fairly common (if somewhat expensive to keep) pets in Dernmarik and are normally trained to – in situations of peril or on command – generate their pocket-dens and admit such members of their “families” as may be in the area with them. Pocket Bears tend to make excellent pets for people from Dernmarik (who all have a bit of unconscious reality-shaping from their own Birthrights, and so find that their pets tend to be healthy, understanding, and clever because they like to think they are). They are more dubious pets for others however, as they are quite strong enough to seriously injure a human entirely accidentally. Favored treats for “Pocket Bears” include bacon, sausage, scrambled eggs, pancakes and syrup, honey, and various nut-pastries. Birthright: Occult Sense/Dimensional Awareness (Their basic senses extend into adjacent dimensional spaces, 6 CP), Inherent Spell with +6 Bonus Uses (Spacewarp with closeable access, normally a six hour duration, L3, 15 CP), Immunity/dimensional access difficulties (Uncommon, Severe, Minor, Specialized and Corrupted/only to prevent their own spacewarp effect from causing problems when used on Atheria (2 CP), Immunity/the need to wake up to renew their dimensional pocket effect (Uncommon, Minor, Trivial, 1 CP). Net 24 CP. The Parack (Storm Domain) Black Bear or “Thunder Bear” possesses the ability to generate a formidable electrical aura that both protects it and augments it’s attacks and to project it at ranges of up to fifteen feet – as well as low-grade resistance to electrical and weather effects. In the wild it usually uses those abilities for self-defense and to take down small prey – such as the Parackian Flying Fish (whether they’re in or out of the water). Occasional crossbreeding with the domestic “Pocket Bear” of Dernmarik has left the “Thunder Bear” slightly more tolerant of humans than most wild bears, but they still make very chancy pets unless mystically bonded with their owners. Innate Enchantments: Lightning Shield (L1, does 1d6 electrical damage to anyone who hits the creature touched with a natural weapon, unarmed strike, or mostly-metallic weapon, in the next round. Unlimited-Use Use-Activated, CL1, Personal Only, 1400 GP), Shocking Grasp (CL1, Unlimited-Use Use-Activated with Rapid Casting, linked with normal attack, 4000 GP) (6 CP). Thunder Bear Style (Instinctive Str-Based Martial Art +12 (16 total): +2 AC, Standard DR 3/-, Reach (Specialized/only projects the Shocking Grasp effect, +10 feet), Blinding Strike (lightning flash), and Combat Reflexes (12 CP). Lunge: +5′ to reach, Specialized/only for use with Shocking Grasp (3 CP). This gives it a total reach of 15′ with respect to Shocking Grasp and two Attacks of Opportunity. This can be a fairly unpleasant surprise for anyone closing with one. Immunity/Weather and Electrical Effects (Common/Major/Trivial, reduces damage from such sources by five points, 3 CP). Parackian Fish, like other egg-layers, have their birthrights determined by where the egg is laid, not where it hatches. They normally possess a somewhat clumsy ability to fly, used to bypass the tremendous number of waterfalls in Parack, to colonize new lakes in Parack’s swiftly-eroding and uplifting terrain, to escape pools that have been cut off, to catch flying insects and reach food that would otherwise be out of reach, and to evade nets and predators. While they remain gilled water-breathers, Parack’s near-constant rains generally keep their gills moist enough to allow them to remain aloft for a mile or so. Birthright: Celerity with Additional Movement Mode/Flight, Specialized for only allowing low altitude and limited maneuverability, 9 CP. While there have been horror stories about Parackian Piranha their existence has never been confirmed. Don’t go near that thing! You don’t know where it’s from! down Parack’s flying fish, create a private missile-deflecting whirlwind (like a Wind Wall), project concessive blasts, conceal it’s scent, scoop fish out of the water with small whirlwinds, protect itself from weather, send small objects flying, break falls, and many similar tricks. They are quite touchy, unusually predatory for bears, and extremely dangerous. Innate Enchantment/Manipulate Winds (Level Three Greater Invocation/Wind Control (can produce wind effects of up to level two), Caster Level Five, Unlimited-Use Use-Activated, 30,000 GP / 30 CP).